As part of fixed income fund or taxable bond fund, ultra-short bond fund can be used for any short term investment or asset diversification. It can also use to hedge against rising interest rate environment. 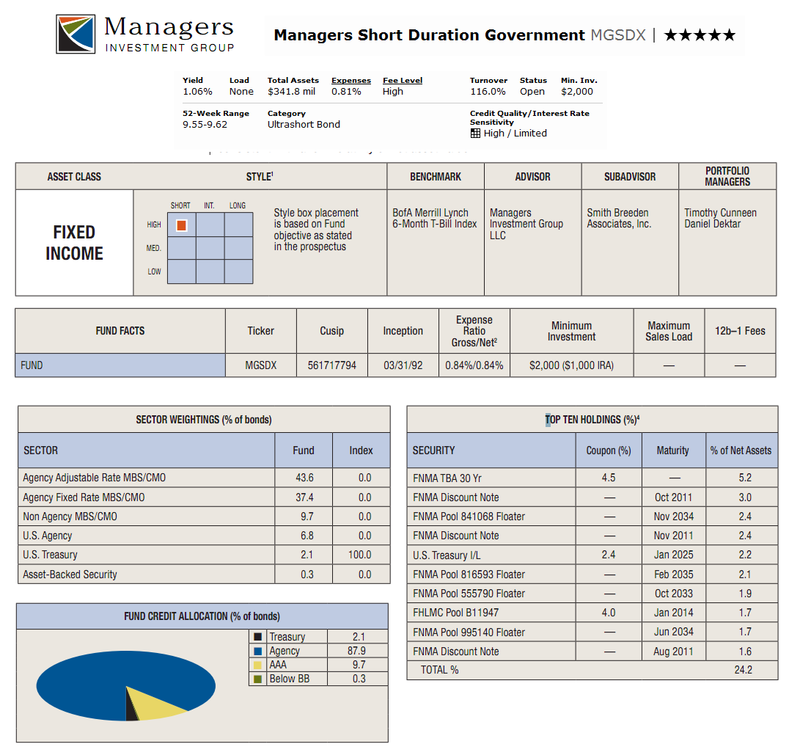 One of this best rated ultrashort taxable bond fund is Managers Short Duration Government. More Best funds are available on MEPB Financial. According the fund’s prospectus, the Managers Short Duration Government fund seeks current income consistent with low volatility of net asset value (NAV). This Managers fund invests most of net assets (>80%) in US Government bonds (debt securities). It may use synthetic instruments or derivatives similar to the bonds or debt securities. It also may employs hedging techniques, such as interest rate futures, options, caps, floors, and swaps, to reduce the interest rate risk of its fixed income securities. This Ultrashort Bond fund may use leverage. Since December 2005, Timothy J. Cunneen has been the fund’s manager. This MGSDX fund was introduced to public in March 1992. The bond fund has a dividend yield of 1.06% per year. The fund’s annual expense ratio is 0.81%. This top taxable bond fund has no 12b1 fee and no front-end sales load fee. There is no other class available for this fund. The benchmark of this fund is BofA Merrill Lynch 6-Month T-Bill Index.The fund's effective duration is 0.3 years. To invest in this top bond fund in regular brokerage account, investor will need $2,000 minimum initial balance. For retirement account (IRA, 401k, or other tax deferred accounts) or 529 account, you will need $1,000 min balance. The minimum subsequent investment for both accounts is $100. This MGSDX fund can be bought from a wide selection of 101 brokerages include Merrill Lynch, JP Morgan, T Rowe Price, E Trade Financial, UBS Financial Services, Vanguard NTF, Mony Securities Corp, EP Fee Large, Td Ameritrade Inc, etc. For details about this fund, you can check with your local brokerage agent or brokerage account. 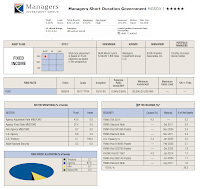 The top sector weightings of this Managers fund as of June 2011 are Agency Adjustable Rate MBS/ CMO (43.6%), Agency Fixed Rate MBS/ CMO (37.4%), Non Agency MBS/ CMO (9.7%), U.S. Agency (6.8%), U.S. Treasury (2.1%) and Asset-Backed Security (0.3%). The top five holdings are FNMA TBA 30 year (5.2%), FNMA Discount Note (3.0%), FNMA Pool 841068 Floater (2.4%), FNMA Discount Note (2.4%) and US Treasury (2.2%). There are various principal risks such as Asset-Backed and Mortgage-Backed Securities Risk, Basis Risk, Credit and Counterparty Risk, Derivatives Risk, Hedging Risk, Inflation Risk, Interest Rate Risk, Leverage Risk, Liquidity Risk, Market Risk, Prepayment Risk, Reinvestment Risk, US Government Securities Risk, etc.